So far we’ve harvested two small pumpkins from our garden. I’m so glad we planted pumpkin this year because I’ve always wanted to make my own puree. It was really simple and I can’t wait use it up in all kinds of recipes. 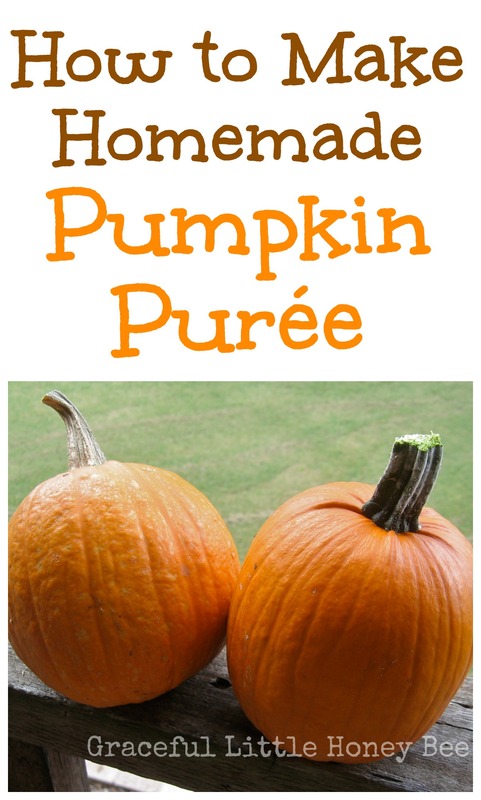 Here is how to make pumpkin puree from fresh pumpkins. Choose small, dense pie pumpkins. Preheat oven to 350. Cut pumpkins in half. Scoop out seeds and guts with a spoon. You can save the seeds for planting or eating. Cover a pan with foil, place pumpkins on top and cover pumpkins tightly with another piece of foil. Bake for 1 hour at 350 degrees. Check with a fork to see if flesh is tender, if not you will need to bake longer. Scoop out flesh and process in a blender or food processor until smooth. My two small pumpkins made almost 3 cups of puree. Scoop out seeds and stringy guts with spoon. Lay pumpkin halves flat on foil lined baking sheet. Flesh should be fork tender. Scoop out flesh with spoon and puree in blender. Exactly what I needed today! Perfect timing!! Thank you!! I was hoping to find a puree how-to in today's blog hop, so thanks for sharing! I bought some pie pumpkins from our local farm stand yesterday. I didn't get them done in time for this morning's pumpkin griddle cakes, but I'm sure I'll use it up this week. Just working on freezing my own homegrown pumpkins right now, letting the last half drain before I run it through the food mill. I freeze in 2 cup containers and use through out the year for my breads and pies...love home grown goodness!